An egg frittata is an Italian version of the French omelet. 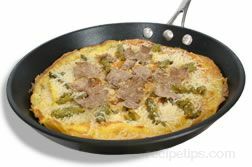 It is not folded over like a French omelet, but rather, it is open-faced, and the preparation is also slightly different. A French omelet is cooked very quickly on high heat; however, an egg frittata is cooked more slowly, requiring much more time than a traditional omelet. When cooking an omelet, any additional ingredients, such as cheese, vegetables, and meat, are placed on one half of the omelet prior to folding it over into a half moon shape. The other ingredients added to a frittata are stirred into the eggs and cooked at the same time, which results in the longer cooking time required for the frittata. An egg frittata can be a very substantial dish. It is often suitable as a satisfying lunch or dinner entrée. The recipes for frittatas are endless in terms of the types and number of additional ingredients that can be used in the frittata. Healthier versions of the frittata can be prepared, such as using two egg whites for every yolk or using commercially prepared egg substitutes instead of whole eggs.